Few wildlife experiences could compare to the sight of a massive whale majestically rising out of the water and flopping backwards, or a pod of dolphins playfully showing off their acrobatic skills. The Great Barrier Reef is a vitally important breeding ground for about 30 species of whales and dolphins (or ‘cetaceans’). One of the most commonly sighted whales are the massive humpbacks which make the trek to the Reef’s warmer waters from Antarctica between May to September to court, mate, give birth or rear their calves. It’s critical for their continued survival that their ‘nurseries’ are available to them, free from any harassment which may lead to calf mortality. 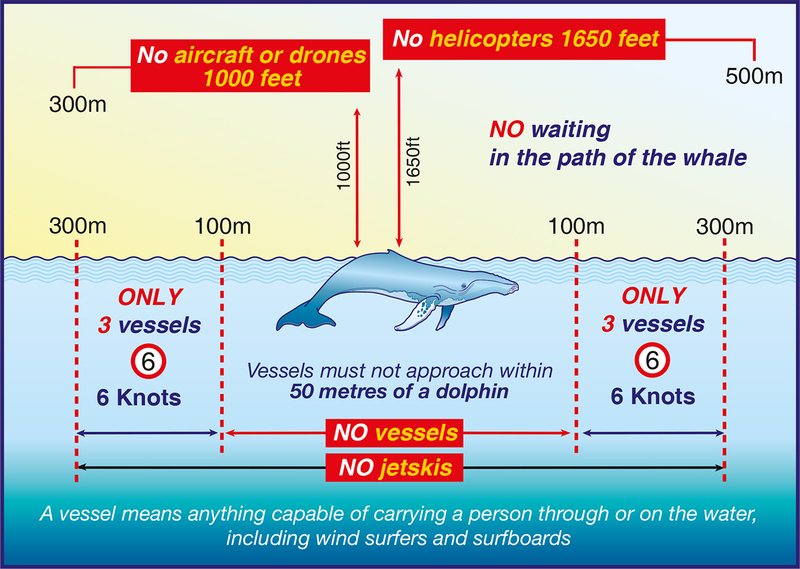 As someone who shares the waters with the Reef’s precious cetaceans, you have a responsibility to help protect them and to keep safe distances (refer to diagram below). By following these responsible practices when you’re in the vicinity of whales and dolphins, you’re not only playing a big part in their conservation but you’re also providing a safe environment to watch them. Report sick, injured, stranded or dead whales or dolphins. Also report if your vessel accidentally strikes a whale. Report any boat strikes and reassure your passengers that the relevant authorities have been contacted to assist the whale. If you do come across dolphins bow riding, maintain a constant speed and direction. When operating a vessel or aircraft check safe distances diagram (above).